Did you ever got jealous of your friends with HTC HD2 which has this beautiful animated weather background which changes automatically with real weather forecast? Comes in Let It Snow Widget theme which brings snowy animation background right on your iPhone and iPod touch screen. 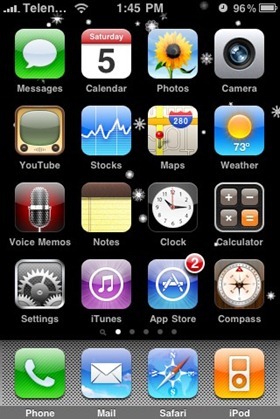 The main purpose of this theme is to display snowflakes which falls on the home screen right behind all the icons. The overall effect is really nice as can be seen in the screenshot below. Step 1: You will need to have a jailbroken iPhone or iPod touch to install this theme. 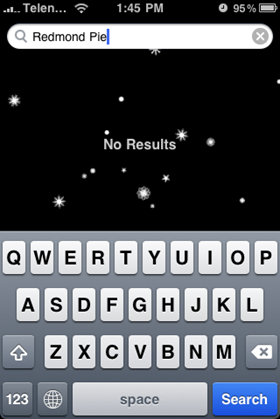 Follow our complete step by step guide posted here to jailbreak your iPhone with the latest iPhone 3.1.2 firmware. Step 2: Let It Snow Widget theme is available on http://cy.sosiphone.com/ repository and needs Winterboard app from Cydia to activate. Make sure you have installed Winterboard and have added http://cy.sosiphone.com/ repo in Cydia. Step 3: Once you are done with all the steps above, simply activate the Let It Snow Widget theme from Winterboard to make it fall snowflakes all over your iPhone home screen. Here is a video showing the theme in action on the iPhone. Looks good, but definitely delays the page loading/swiping speed on my 3G. 3GS users should give this a go!